The 31st Thomas Mar Athanasius Memorial Lecture was held on 3rd December 2017 at 4.00 pm in TMAM Research and Orientation Centre Auditorium. Most Rev. 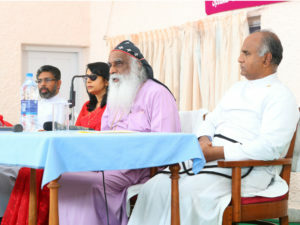 Dr. Joseph Mar Thoma Metropolitan presided over the meeting. Dr. Usha Titus IAS, Secretary of the Department of Higher Education, Kerala was the Chief Guest. 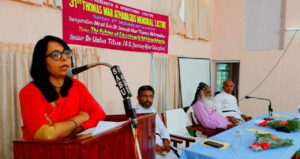 Mar Thoma Metropolitan in his speech emphasized the need for Mar Thoma Church to understand the role it has to play in higher education space to create and retain talent and expertise within the church and society. Education should enable students to create opportunities by adapting to disruptive innovations and technologies. Students need to develop Analytical and Critical Thinking, Problem Solving Skills and Effective Communication Skills. Students should be Life-Long Learners to learn and adapt to the changes, especially in the use of technology. Dr Usha narrated the way of life of people from Jewish origin who are very successful in science and business. 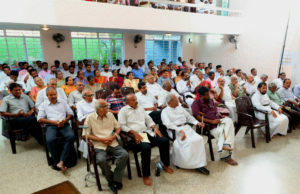 She encouraged the audience to adopt the best practices from them. Expecting Jewish mothers work out a lot of Math and listen to a lot of music. For children, emphasis is given to reading, writing and understanding concepts right from their childhood. Jewish homes also have overflowing bookshelves. They learn Maths, Science and business and three languages in school. Scripture and Prayers are integral part of curriculum. Furthermore, they indulge in two sports and master two musical instruments while studying. We must note that all of us are different. So, we need personalized training plans for students based on child’s ability and interests. Technology has also opened a lot of opportunities to pursue one’s interest. Another important point is High Performance always goes beyond Intelligence. To become a high performer, we need to inculcate character of curiosity and persistence into a child’s personality. It is the character that makes one a great achiever – a character of curiosity to understand what lies beneath a problem and the character of persistence to arrive at the right solution.